PISA in Brief summarises the results from the PISA 2009 assessment of students’ reading, mathematical and scientific literacy skills. It tells us about how students performed in the assessment and describes some wider findings about what lies behind their results. 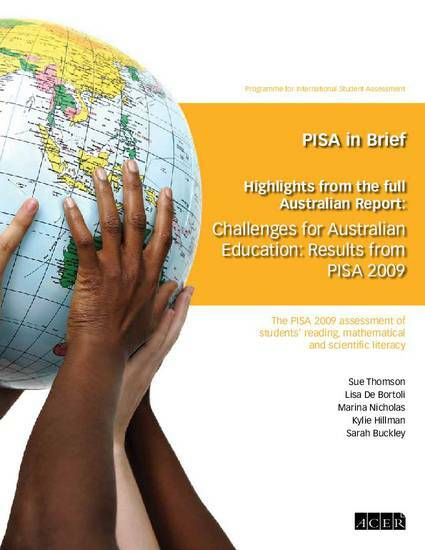 The full Australian report is called Challenges for Australian Education: Results from PISA 2009, and is available from http://www.acer.edu.au/ozpisa/reports. PISA 2009 assessed students’ capacities to apply knowledge and skills in reading, mathematical and scientific literacy. More assessment time was given to reading literacy, as this was the main focus for this cycle. Reading literacy was also the focus of PISA 2000, which allows us to make comparisons of reading performance between 2000 and 2009. In 2003 and 2006, more time was devoted to assessing mathematical and scientific skills and knowledge respectively. In 2012, the focus will again be on mathematical literacy and any changes over time will be able to be monitored. In this way, PISA provides regular information on educational outcomes within and across countries. It provides insight into the range of skills and competencies in different assessment domains that are considered to be essential to an individuals’ ability to participate in and contribute fully to society, particularly a society that experiences rapid technological change. PISA, like many other international studies, reports results as mean scores – a measure of average performance – along with various statistics that reflect the distribution of performance. PISA also provides a more detailed picture of performance by providing a profile of what students have achieved in terms of skills and knowledge – what they can do and what they know. This performance scale is divided into levels of difficulty, or ‘proficiency levels’. Students who have reached a particular proficiency level not only typically demonstrate the knowledge and skills associated with that level, but also the proficiencies required at lower levels. A student who performs at proficiency level 4, for example, is expected to show all the skills and knowledge of Levels 2 and 3, and to be able to complete any assessment tasks that are illustrative of those proficiency levels.